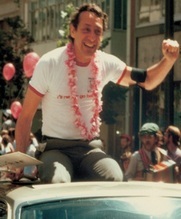 Harvey Milk. Anne Kronenberg. Tory Hartmann. Tom Ammiano. Jim Elliot. Henry Der. Jeannine Yeomans. Bill Kraus. Sally M Gearhart. Documentary. Civil Rights. 1970s. Politics. Gay Interest. Leftie Flicks. 01 Tara's Midnight Movies. Oscar (Best Documentary). Lesbian Interest. Recommended. This honest and affecting documentary uses news reports, archival footage and talking heads to describe the politics of the gay rights movement surrounding the election and assassination of openly homosexual San Franciscan councillor Harvey Milk. The movie concentrates on the emergence of a gay political movement within the electoral system, the 1978 fight against Proposition 6, which would have banned gay and lesbian individuals from teaching in schools, and the scandalously low sentence given to his assassin.